KT Tape is conveniently packaged in rolls of 20 precut strips. Simply tear off a strip, remove the backing and apply according to the instructions included in every package. Because most applications use two strips, it’s easy to create your team colors by using one strip of each color. The new colors include burgundy, forest green, gold, grey, light blue, navy, orange, purple, white and a completely off-the-wall camo pattern (not sure which team wears camo, but I don’t think I’d like to compete against them!) 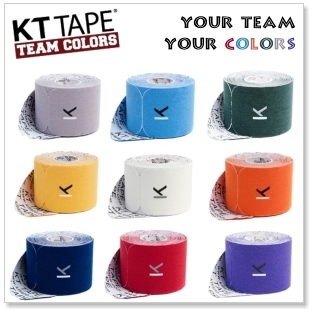 KT Tape is also available in the more traditional kinesiology tape colors of beige, black, green, red, pink and royal blue. In addition to the single rolls of precut strips, KT Tape also comes in classic uncut rolls in both single and bulk sizes.